As a senior preparing to graduate from Temple University, a member of PRSSA’s Temple Chapter, an intern at the Philadelphia Bar Association, and a member of PPRA serving on its College Relations Committee, this year’s 10th Annual Careers 101 event will forever be memorable. After reading my intern supervisor and PPRA’s President-Elect Meredith Z. Avakian-Hardaway’s pre-Careers 101 blog post, I got an idea of what Careers 101 could offer and it turned out just as great as I envisioned. Moderator: David Brown, Managing Director, The Marketing Collaborative & Executive Director of the West Philadelphia Alliance for Children. Bill Cowen, President, Metrospective Communications LLC & Professor/PR Program Director, Villanova University. Bonnie Grant, Executive Director, Greater Philadelphia Life Sciences Congress. Cathy Engel Menendez, Communications Director, PECO. Lisa Simon, President, Simon Public Relations Group, Inc.
Mark Tarasiewicz, Executive Director, Philadelphia Bar Association. 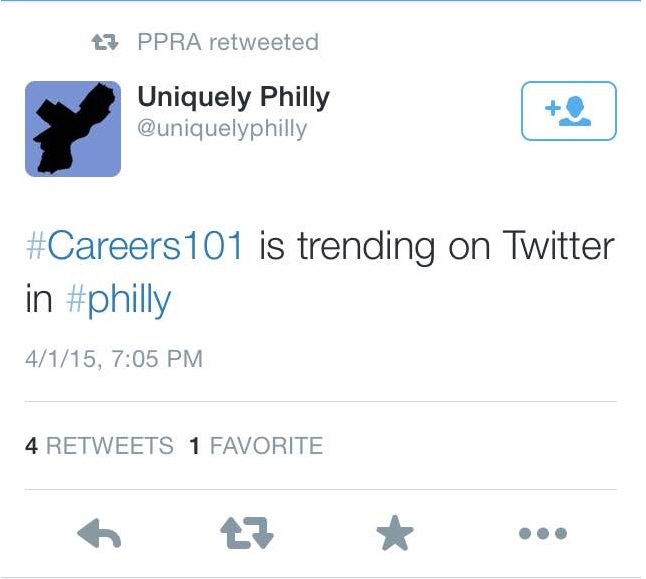 There was definitely much to be heard from the panelists and moderator, so much so that #Careers101 was trending on Twitter from all of the attendee tweets. Attendees also had the opportunity to have their resumes critiqued, their headshots taken and 10 lucky winners won shadow days and informational interviews with local PPRA leaders. The event was held at The Liacouras Center on Temple University’s Main Campus, but Temple certainly was not the only school represented at the event. Students from La Salle, Stockton, Penn State Abington, Drexel, Villanova, Rowan and Monmouth universities were all present. This definitely made the event that much more rewarding. It is always a pleasure to have the opportunity to network with students from other universities that share the same passion for PR as you. As a PR professional, it is our job to be “in the know” at all times, simple but vital advice. Knowing what’s going on locally and nationally is beneficial in so many ways. Not only does it give you topics to talk about while at networking events, it will also set you apart. If you can comment on important issues that are happening, professionals will recognize that. It shows that you care and it’s helping you learn and grow as a young professional. “If you ever take your career seriously it should reflect on your social media. Add an element of advanced maturity to your social feed,” added Mark Tarasiewicz. This definitely hit home for me and probably most of the students and young professionals in the audience. Your social media can reflect your maturity level. Being the generation that grew up with social media, it is easy to forget how much of an impact it can have. Bill Cowen also stressed the importance of maturity and emotional intelligence, which as a young adult can often be our weakness as we are taking our first steps into adulthood. “Emotional intelligence will serve you better than anything … become a storyteller!” said Bill Cowen. “If you’re resilient, you’ll be indispensable.” – Cathy Engel Menendez. All of the panelists gave amazing advice and provided me the reassurance I needed as I am about to graduate and embark into my adult life. Joining PPRA and having the opportunity to be on the College Relations Committee and help put together Careers 101 was beyond beneficial for me. As I am approaching graduation and meeting more and more PR professionals, it seems as if the [PR] world is getting smaller, especially in the Philadelphia area. Networking is extremely important and Careers 101 was a great platform for any student or young professional interested in PR. Your Career is no joke and it’s time to start it! Cara McArdle is a senior at Temple University majoring in Strategic Communication, concentrating in Public Relations and International Communication. She also interns at the Philadelphia Bar Association, is a PPRA member serving on its College Relations Committee and a member of PRSSA’s Temple Chapter. Follow Cara @CARAmel_appless on Twitter and connect on LinkedIn at https://www.linkedin.com/in/caramcardle. 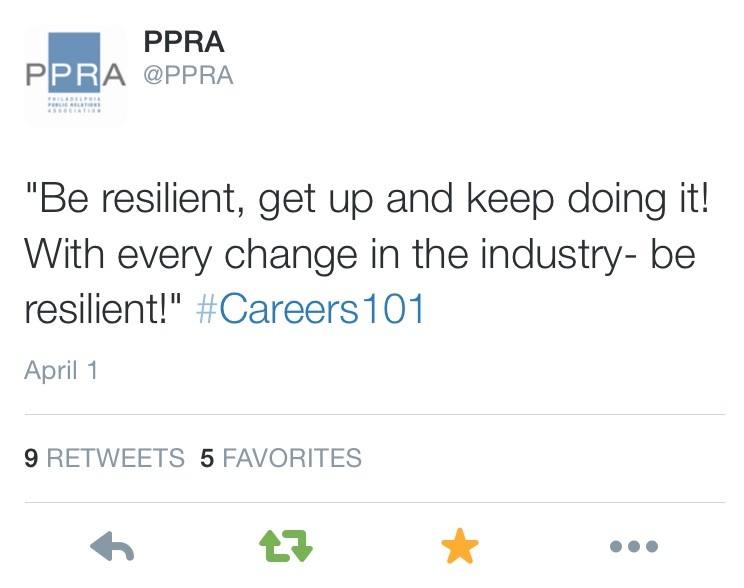 This entry was posted in College Relations, Events and tagged Career Advice, Careers 101, College, College Relations, College Students, Connections, Greater Philadelphia, Networking, PPRA, PR, Public Relations, Young Professionals by pprablog. Bookmark the permalink.